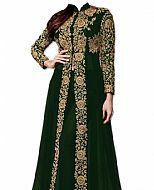 Pakistani A-line dresses, online Indian Pakistani A-lines suits. 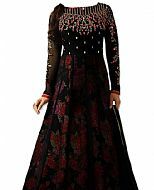 Pakistani A-line dresses are quite unique in designs and have exquisite hand embroidery with sequins, dabka, beads and diamantes work. Women in India and Pakistan like to wear new and latest A-line salwar kameez dresses on most function. A-line suits are worn on functions like anniversaries, weddings, birthdays, parties and other such occasions. 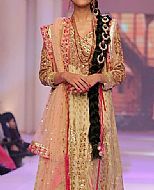 Our website has all the Pakistani Indian A-line dresses for customers in USA, Europe, UK and all over the world. At 786shop.com, it is very easy for women across the world to buy A-line dresses for their special occasions. 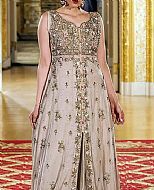 The best thing about buying Indian Pakistani A-line dresses online is that you can get them tailored as per your custom requirements. Online Pakistani A-line dresses give you the option to submit your custom sizes as well as various styling options. Now a days, A-line dresses are gaining popularity because of their charm and quality of fabrics and embroidery works. Indian A-line salwar kameez dress is a comfortable and all weather dress. Online Indian Pakistani A-line suits are very graceful and charming. "Just wanted to let you know I have indeed received my order, and absolutely loved it! I truly do appreciate your service, you have really made it so much easier for Pakistanis living abroad..."